Well, this certainly changes the rules a wee bit. …that had also targeted “at least twenty” other major multinationals across a variety of sectors. Google is now undertaking to “review the feasibility” of its Chinese operations, including the ongoing state-ordered censorship of search results, and says it may cease its Chinese site, Google.cn, entirely if it is unable to reach an agreement with the government. In 2006 when Google launched its Chinese site and agreed to remove search results that fell foul of The Great Firewall of China, I wrote an opinion piece for The University Observer on how I felt Google had, in essence, sold out by agreeing to curb the free flow of information and foregoing the concept of net neutrality by allowing its results be manipulated by outside agents (in this case the Chinese authorities). When I became an intern at Google that summer, and the intake were offered an audience with the senior legal heads at the European HQ, it seemed to be the only topic any of us wanted to discuss. While at the time Google said it reserved the right to review its operations should circumstances dictate, nobody suspected that they actually would. Four years on, and here we are – watching the world’s biggest and most well-known internet company threatening to withdraw from what has become the world’s biggest internet population, and perhaps forever closing the book on its mission to organise the world’s information and make it universally accessible and useful. Reading between the lines on Google’s extraordinary blog post, it’s difficult to see how the tapping scheme being referred to could originate from anywhere other than the Chinese government themselves. If this scam was being perpetuated by some kind of vigilante mob, or a pro-suppressive pseudo-terrorist group, then Google wouldn’t be massively concerned about ethics: they’d merely be informing the FBI and local authorities worldwide (one must assume, in fairness, that China would do little to help). But Google aren’t doing that. They’re going straight to the government to complain – meaning that the offending party is probably the government itself. I have no doubt that China aren’t the only country operating a global email tapping scheme; I’d wager that almost all tech-literate nations keep some kind of covert eye on what les indesirables might be getting up to, quite possibly including Ireland. China is no doubt alone in its actions. But when you’re China, you’re going to be watched; and if you’re going to pick a fight with the world’s biggest internet company, eventually they’re going to notice and track you down. we are no longer willing to continue censoring our results on Google.cn, and so over the next few weeks we will be discussing with the Chinese government the basis on which we could operate an unfiltered search engine within the law, if at all. We recognize that this may well mean having to shut down Google.cn, and potentially our offices in China. To put it simply, a Chinese government that has gone out of its way to suppress any active and apparent opposition, and to expunge events like the Tiananmen Square protests from history (oddly, there lies a plaque in the centre of Tiananmen commemorating the fact that in 1989, ‘nothing happened’) is not going to allow itself be pressured by an outside agency to immediately change tack. An uncensored Google.cn would allow Chinese surfers view material relating to all manner of events that China would rather have its people not know about. I used to work with a Chinese woman and had to sit her down one day to watch the iconic video of the 1989 protests, including the scene where the lone man stood in front of the tanks on the abandoned streets. She had never seen it before; she had only heard the slightest rumour, and only since she had moved to Ireland, that there was some kind of minor kerfuffle in the capital city. China is well-schooled in the art of suppressing information; Google kicking up a fuss is not going to make it change tack. And so, Google will pull out of China. And therein lies the kicker. 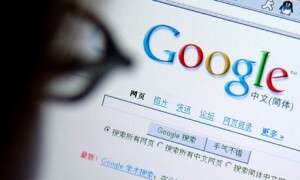 If the scam Google have uncovered is far-reaching enough to merit informing almost two dozen other major multinational corporations, and has Hillary Clinton calling on Beijing to explain itself (following her President’s lead in declaring internet security a “national security priority”), it’s highly probable that Google won’t be the only major company closing its Chinese doors. A mass withdrawal of U.S. corporations from China will inevitably mean the discussion of trade sanctions against China, on a scale dwarfing the nature of America’s issues with Cuba, and – quite possibly, and I don’t believe I’m over-reacting in suggesting this – a new economic Cold War.